The shipping industry is key to Europe's economy, with 3.8 billion tonnes of cargo loaded and unloaded at European Union ports per year. But it is facing a growing security risk as smugglers transport everything from drugs and explosives to counterfeit goods via the sea. 'The idea came about because customs officials need to check an ever-increasing number of containers—for this they need to check them fast without opening them,' explained Guillaume Sannié of France's Alternative Energies and Atomic Energy Commission (CEA). 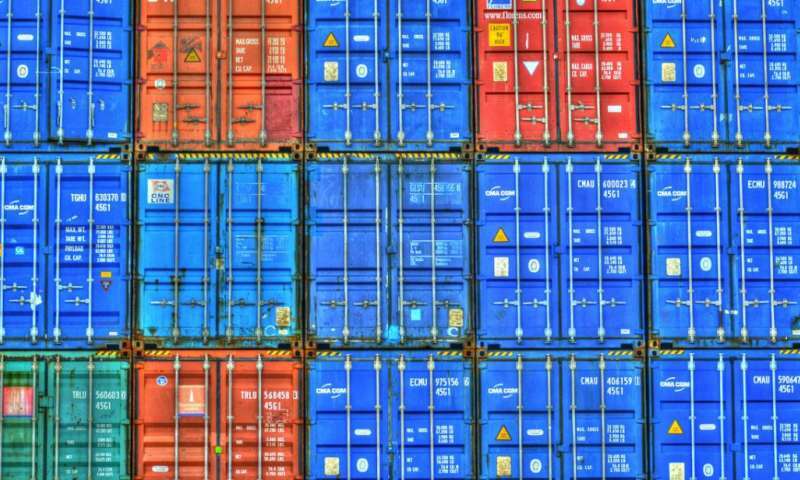 He coordinates the EU-funded C-BORD project, which is developing five tools for custom agents to inspect containers by building on technologies that are already in use, expanding their scope and developing new methods. Evaporation-based testing is one tool in the C-BORD toolbox—an electronic device made up of multiple highly sensitive sensors, each attuned to detect a different chemical substance. This is used to analyse the contents of the container, allowing the operator to detect illegal drugs, explosives, chemical agents. It can also detect people. The team is also investigating an experimental technology for use when customs officers are still in doubt after using traditional methods such as X-rays—which reveal the shape of an object but not its composition—and the electronic sniffer dog. They use a machine known as a neutron generator to emit neutrons—particles that help make up the nucleus of an atom—and then fire them at the container, in a similar way to taking an X-ray. By measuring the gamma rays produced as a result, customs officers can glean more information about the chemical composition of what's in the container. The researchers are also investigating using high-energy imaging made possible by photofission, the process by which a nucleus splits after absorbing a gamma ray, to detect nuclear material. By measuring miniscule timings between high-energy pulses, it's possible to detect whether uranium or plutonium are present in the container. Before the project finishes in October 2018, Sannié says the team will be testing its range of technologies at two ports—Rotterdam in the Netherlands and Gdansk in Poland as well as in Hungary, where the tests will take place on a land border. With about 90 % of the European Union's external trade and 40 % of internal trade transported by ship, keeping Europe's ports safe from threats such as terrorist attacks or organised crime is also a challenge for authorities. Here, IT and communications systems can play a role, according to the EU-funded SUPPORT project, which brought together 20 European organisations, including businesses, academia and port operators, with the aim of improving security. 'In the end, a lot of the benefits of SUPPORT were about stopping theft and pilfering,' said David Griffiths, Research Information Manager at BMT Group Ltd, the UK-based company that coordinated the project.